As...to sell imported products at shops in Japan, it is necessary to do what are written below. ・Needle-Check:Check every item to see if there is anything dangerous such as needles and staples. Such a thing is needed. We check the labels and tags. 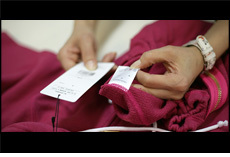 We confirm if the labels and tags show the same information on fabrics and country the product was made. 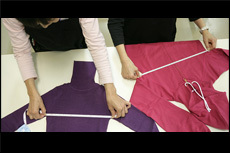 We also check dirt, stain, damages on clothes and size of clothes as well. We can give several different types of checking methods depending upon customers' requests. 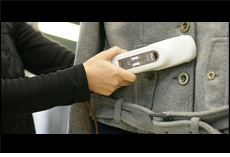 We use the handy needle-searcher for items that can have magnetic induction such as buttons and zippers. Some imported items need laundry-label sewn. 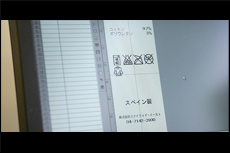 We order or make fabric labels and laundry labels based on the Quality Labeling Laws of Household of Japan. We translate labels in other languages to Japanese. We sew the labels on each item after issued. We usually sew it on the original label. After this process is done, these items will be needle-checked. We are equipped with twelve professional-use sawing machines for laundry-label-attaching use only. It could depend on the items and lots, but we are capable of attaching three to four thousand per day. We also clean the dirt and bleach the stains off the items with special cleaner, and tap with cloth. We discuss which cleaner to use with the clients before use. 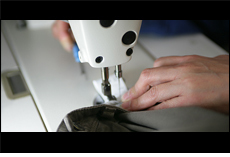 We press the wrinkled clothes with high-temperature steam to make the items look as just made.